You won’t ask “where’s my ring?” anymore when you use this stylish ring holder to protect your fine jewelry against scratches and hard surfaces. Small enough to use on a nightstand, at a make-up dresser, and the window ledge by the kitchen sink. The designs with a bowl base also can contain earrings or a special bracelet or two. Perfect for a Mother’s Day gift, engagement gift, wedding gift, or simply a gift for her. 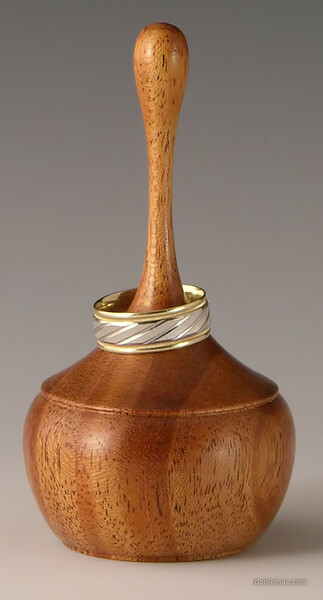 And even a man’s version, perfect for that cherished wedding band. Jewelry not included. All wood gifts are hand turned, assembled to exacting standards, and beautifully finished. Available in a variety of woods and sizes. Purchase items through my Etsy shop.